Thunderbird’s email reply header is short and not like the ones in Outlook and other email lients. 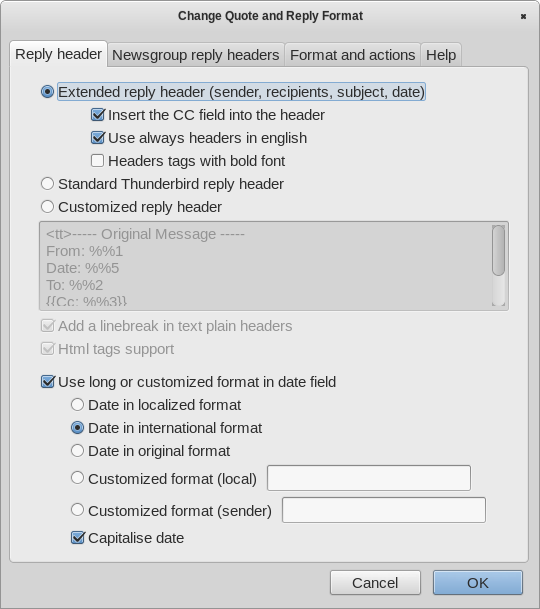 Thunderbird provides several integrated reply headers. However, the Outlook-style reply header with sender, receiver, date, and other information are clear and useful (e.g. my boss cc’ed an email to me to let me handle a request and I can simply find out the requester’s email from the email’s reply header) and asked for under some situations (e.g. the financial office asks for the corresponding emails with these email reply headers for reimbursement). 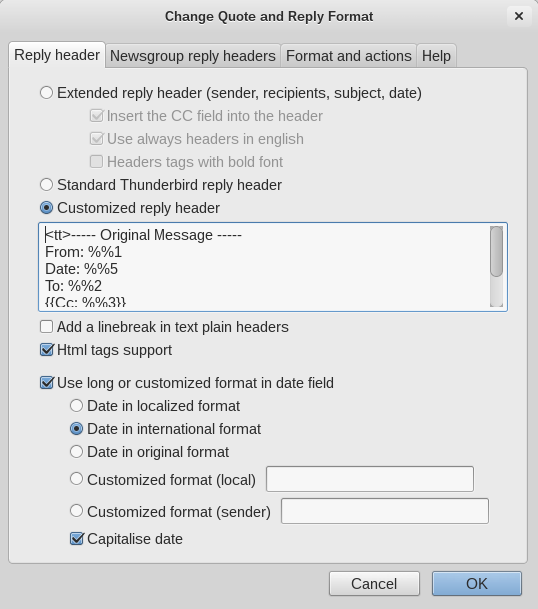 I do not find an easy way to configure Thunderbird to generate Outlook-style email reply headers. However, there are some Thunderbird plugs that can generate the header for me quit well. The SmartTemplat4 plugin is actually an email template plugin. 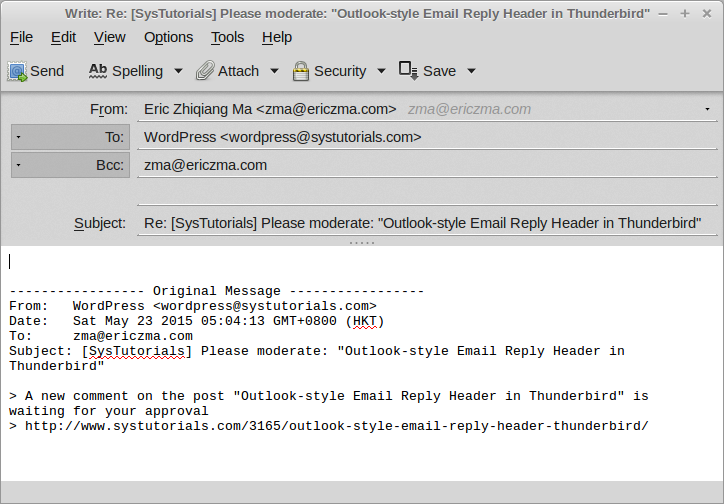 It is powerful to change the reply header of the Thunderbird emails and hence be able to "modify" the reply header. It support HTML which is expressive enough to compose the Outlook like email header. You can search and install the Plugin in Thunderbird Add-ons management page. After installing it, you need to configure it by using the configuration tool found from menu "Tools -> Add-ons Preferences -> SmartTemplate4". Here is a screenshot of the configurations and parameters I use. Here is my Quote Header style for reply emails. This is the key part to compose the "Outlook style" header. The "Variable" tab on the right side of the dialog gives detailed descriptions of the variables used here. Remember to select the "Apply the following template to the replied message" and "Use instead of default quote header" options. Note that the %cursor% is within the <div style="font-size: 11pt;"> tag. I do this because I would like to control the font size. You may adjust the styles as you like. Remember to select the "Use HTML" option and unselect the Replace line breaks with <br> because we already use the HTML <br /> to control the line breaks. Please also pay attention to the options on the right hand side of the configuration dialog. Choose and tune as you like. The screenshot shows my favorite choices. One example of how the format looks like in Thunderbird 60 in Linux is in the screenshot as shown in the earlier part. (The plugin I use to remove the > or vertical bar of the replied email content is ReFwdFormatter, if you would like Thunderbird to remove the > prefix or the vertical bard). Please note that the version 0.8.7.1 only works for Thunderbird up to certain versions. With Thunderbird 60, it does not work. You may wait for the updated versions. The plugin has a pre-configured reply header style. It is good for common usage. 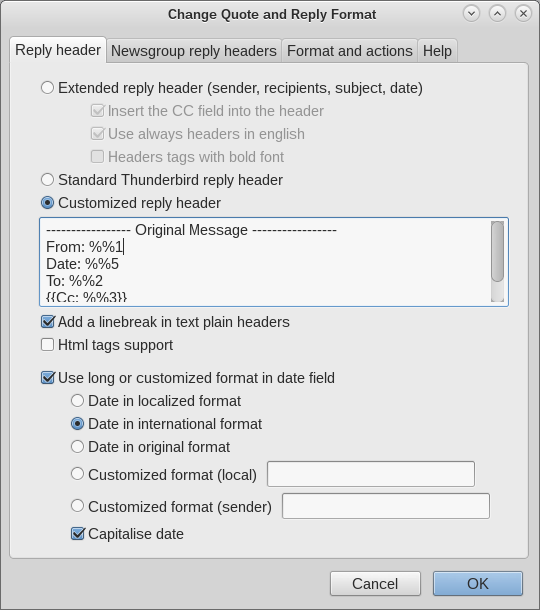 In the configuration dialog, you can configure the style that you like as the one in the figure “Thunderbird Change Quote Reply Format to Outlook-like style”. Here is my preferred email reply header in my Thunderbird. Here is a list of all syntax from the plugin’s ‘help’ tab in its configuration dialog. just if the header inside is not null. %A = "AM" or "PM"
Note: version 0.7.4.2 works well with Thunderbird 24.2.0. The 0.8 alpha8 version has problem yet. 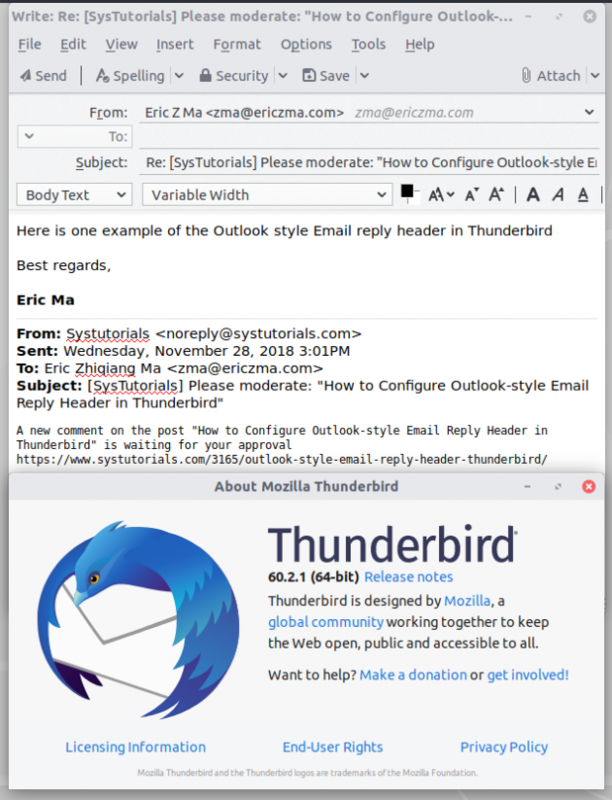 Given Thunderbird’s dearth of echoed header data in its email replies, this Add-On is nearly essential for businesses that use the Thunderbird email program. Thank you Eric! If you are ever in the USA, Bamboo Baits has a free fishing lure for you. Glad to know that the post helps and thanks! The “change quote and reply format” extension seems to have stopped working with a recent Thunderbird update. Do you know if this plugin still works for you? Thanks! I just needed to upgrade the extension. i thought they used to try and do that automatically but I guess not. It works now. Thanks again. Thanks Eric for all your tips. Good stuff. Now is there a way to align all the text in the reply header, i.e. kind of using a tabulator after the colon? That would make the header look really sharp. That’s a good idea! I tried and it works. The only trick is to copy and paste a tabulator from some editors that can accept tabulator input to the plugin’s preference dialog instead of inputting it directly. It seems the Tab is caught by the WM or Thunderbird (I am not sure which one or some other one does this) as a control key action. There is only a space instead of a tabulator for “Subject”. To align the Subject too, two tabulators will be needed in other fields as “Subject” is long. That looks not as good as this one for me. Another closest method I can think about may be to add additional spaces after the colon. This will only look good with monospace fonts. and the corresponding closing tag. Eric, I just installed the add-on. It works great; thank you! Is there a way to make the line headings (To, From, etc.) a bold-face font? I tried to do this by creating it in Word, then copying and pasting it into the add-on, but it did not work. If you know a way to do this, that would be a nice touch. Thanks! Good to know you like it. You may need HTML in the signature. Like <b>bold-face text here</b>. 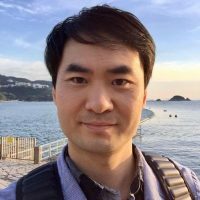 What is the syntax for using codes like %Y when formatting the date %%5? by Eric Zhiqiang Ma @ericzma, Jul 23, 2015 at 1:30 pm. Sadly, the latest version, 0.8.7, seems to be broken on Thunderbird release version 45.0. THe reply headers are correct but when you reply or reply all, the TO, CC etc. fields are not filled in. Equally, when you try to post in a newsgroup, the Newsgroup field is blank and has to be filled in manually. There is a 0.8.7.1 release on the website. Did you try it? Thanks. Yes, that update just appeared yesterday after I emailed kaosmos about the problem (although I have no proof that that was what prompted him to update), and it has fixed it. This plugin is not working on version 60 of Thunderbird. Does anyone have an other option for this plugin? Please check the updated post about the alternative (and better) way using the SmartTemplate4 plugin.